The following tutorial will help you jailbreak your iPhone, iPad (not iPad 2), and iPod touch. The steps are pretty much the same for each device since they all run iOS. Warning: do not proceed if you’re unsure about what you’re doing. There are risks involved. If you need the ultrasn0w unlock–>PwnageTool. Why? PwnageTool will enable you to update to iOS 4.3.3, but retain your old baseband. Click here on how to unlock your iPhone on iOS 4.3.1. Everyone else, redsn0w will work fine on Mac/Windows (if you don’t care about an unlock). Before we begin: sync your iOS device in iTunes. This will create a backup. Step 1: Download redsn0w 0.9.6rc16 andÂ iOS 4.3.3 for iPhone 4 (or find your firmware here). Save everything to a folder on your desktop, to make things easy. Step 2: Launch iTunes (make sure it’s updated). 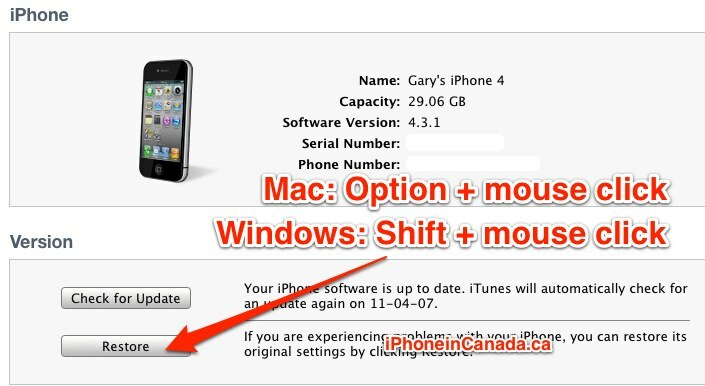 For Mac users, hold Option on your keyboard then click restore (Windows users, hold Shift). A window will pop up, allowing you to browse to the iOS 4.3.2 firmware file on your computer. Select it and your iPhone will restore. Step 3: Launch redsn0w. Click ‘Browse’ and find your iOS 4.3.3 firmware file. Once it’s identified, click Next. Step 4: Ensure ‘Install Cydia’ is ticked off. Click Next. Step 5: Turn off your iPhone, but ensure it’s still plugged into your computer. You’ll be entering DFU mode next. Click Next. 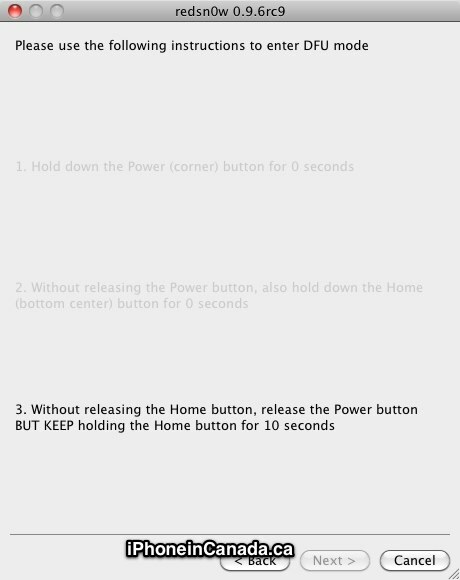 Step 6: Follow the instructions for DFU mode, as it counts down the seconds for you. Step 7: If DFU is successful, redsn0w will work its magic and jailbreak your iPhone. You’ll see a black screen with lots of tiny white text. Just let it complete. Step 8. You should see Cydia on your Homescreen. Voila! Now, sync from your backup in iTunes and Bob’s your uncle.